C. elegans has a highly developed chemosensory system that enables it to detect a wide variety of volatile (olfactory) and water-soluble (gustatory) cues associated with food, danger, or other animals. Much of its nervous system and more than 5% of its genes are devoted to the recognition of environmental chemicals. Chemosensory cues can elicit chemotaxis, rapid avoidance, changes in overall motility, and entry into and exit from the alternative dauer developmental stage. These behaviors are regulated primarily by the amphid chemosensory organs, which contain eleven pairs of chemosensory neurons. Each amphid sensory neuron expresses a specific set of candidate receptor genes and detects a characteristic set of attractants, repellents, or pheromones. About 500–1000 different G protein-coupled receptors (GPCRs) are expressed in chemosensory neurons, and these may be supplemented by alternative sensory pathways as well. Downstream of the GPCRs, two signal transduction systems are prominent in chemosensation, one that uses cGMP as a second messenger to open cGMP-gated channels, and one that relies upon TRPV channels. These sensory pathways are modulated and fine-tuned by kinases and phosphatases. Chemosensory preferences can be modified by sensory adaptation, developmental history, and associative learning, allowing C. elegans to integrate context and experience into its behavior. C. elegans uses chemosensation to find food, avoid noxious conditions, develop appropriately, and mate. It senses chemicals with chemosensory neurons that penetrate the cuticle to expose their sensory cilia to the environment: the amphid, phasmid, and inner labial neurons (Ward et al., 1975; Ware et al., 1975; see Figure 1). 32 presumed chemosensory neurons in the amphid, phasmid and inner labial organs are either directly or indirectly exposed to the environment through openings generated by glial cells called the socket and sheath cell. An additional pair of neurons in the amphid (AFD) is thermosensory. Figure 1. Structure of chemosensory organs. a. Disposition of chemosensory neurons in the animal. Each of the two amphids contains 12 associated chemosensory or thermosensory neurons. Each of the two phasmids contains 2 chemosensory neurons, PHA and PHB. There are six inner labial organs, each of which contains one IL2 chemosensory and one IL1 mechanosensory neuron. There are two URX neurons, one AQR neuron, and one PQR neuron; the endings of these neurons are within the animal, and not exposed. b. Detailed structure of the amphid sensory opening showing the socket (so), sheath (sh), and ciliated nerve endings. AWA, AWB, AWC, and AFD endings are buried in the sheath and not exposed through the amphid pore. c. Detailed structure of the cilia in the 12 classes of amphid neurons. Panels b and c are adapted from Perkins et al. (1986). Chemosensory neurons generally belong to bilaterally symmetric pairs in which the left and right members of each class are structurally similar. Each left-right pair forms a class that can be distinguished from all other classes based on cilium morphology, axon morphology, and synaptic targets (White et al., 1986). Both anatomy and functional studies implicate amphid and phasmid neurons in chemosensation (see Figure 1, Table 1). Additional chemosensory functions are found in other classes of neurons, and male C. elegans have numerous additional classes of chemosensory neurons that contribute to mating (Liu and Sternberg, 1995; Sulston et al., 1980; see Male mating behavior). Table 1. Functions and molecular properties of chemosensory neurons. Table entries in blue are based only on expression patterns; all other entries are based on functional data. GPCRs, G protein-coupled receptors; only odr-10 and str-2 have known functions, but a requirement for either odr-4 (GPCR folding/traffic) or grk-2 (GPCR phosphorylation) was considered functional evidence for GPCR signaling. PUFA, Polyunsaturated fatty acids. Many of the regulatory molecules are expressed broadly, but for these molecules, only functional data were included in the table. Sensory transduction molecules in chemosensory neurons are concentrated in microtubule-rich sensory cilia, which are present at the tips of most chemosensory and many mechanosensory neurons in C. elegans (Ward et al., 1975; Ware et al., 1975). Accordingly, a prominent class of sensory mutant in C. elegans is defective in cilium formation or in the connection between the sensory pore and the nerve endings. The cilium structure mutants have behavioral defects in chemosensation (Culotti and Russell, 1978; Lewis and Hodgkin, 1977) and developmental defects in dauer larva formation and recovery (Albert et al., 1981). They can be recognized conveniently by their inability to take up fluorescent dyes that normally act as vital stains for nine pairs of ciliated chemosensory neurons (Perkins et al., 1986). At least 27 genes can mutate to this phenotype: che-2, 3, 10, 11, 12, 13, 14, daf-6, 10, 19, dyf-1, 2, 3, 4, 5, 6, 7, 8, 9, 10, 11, 12, 13, osm-1, 3, 5, and 6 (Perkins et al., 1986; Starich et al., 1995). 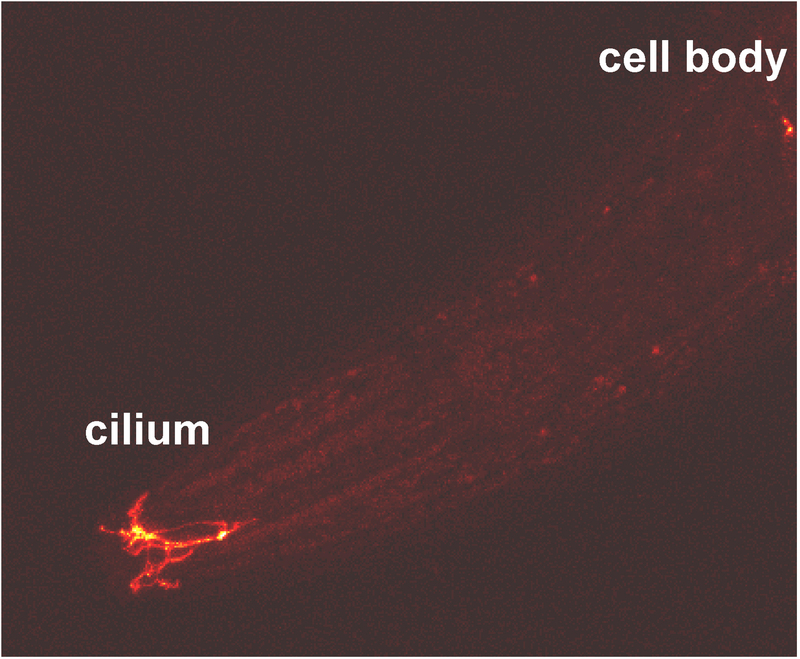 Most cilium structure genes affect the IFT (intra-flagellar transport) system, which directs protein transport and morphogenesis of flagella and cilia in Chlamydomonas, C. elegans, and vertebrates (Blacque et al., 2005; Cole et al., 1998; Collet et al., 1998; Dutcher, 1995; Li et al., 2004; see The sensory cilia of Caenorhabditis elegans). The IFT pathways in different sensory neurons are slightly different (Evans et al., 2006; Qin et al., 2001), and may contribute to their distinct cilium morphologies. Defective cilia are associated with many human disease syndromes; C. elegans cilium structure genes are orthologous to a human polycystic kidney disease gene and multiple human BBS disease genes, whose mutation leads to obesity, mental retardation, and other defects (Ansley et al., 2003; Blacque et al., 2004; Haycraft et al., 2001; Li et al., 2004; Qin et al., 2001). A transcriptional program for cilia development is controlled by daf-19. which encodes an X box transcription factor (Swoboda et al., 2000). daf-19 mutants lack all chemosensory and mechanosensory cilia, but the sensory neurons in these mutants express other cell type-specific markers (Perkins et al., 1986; Swoboda et al., 2000). daf-19 is expressed in all ciliated neurons, and a 12-nucleotide consensus site for daf-19 regulation is found in numerous cilum structure genes (Blacque et al., 2005; Efimenko et al., 2005). Regulation of cilium structure by X-box proteins is evolutionarily conserved in other animals, suggesting an ancient relationship between daf-19 and cilia (Dubruille et al., 2002). The cilium structure genes daf-6 and che-14 affect the connection between the amphid socket cell, sheath cell, and the sensory neurons (Perkins et al., 1986). Both daf-6 and che-14 encode multi-spanning membrane proteins with sterol-sensor domains related to Patched(Ptc) that function in the glial cells (Herman, 1987; Michaux et al., 2000; Perens and Shaham, 2005). daf-6 che-14 double mutants have severe developmental defects including early arrest, suggesting that they have partially redundant essential functions during morphogenesis (Perens and Shaham, 2005). Chemotaxis of C. elegans to some cations, anions, cyclic nucleotides, and amino acids was first described by Ward (Ward, 1973). Although this list has been extended to more compounds, the number of known water-soluble attractants is relatively small (Bargmann and Horvitz, 1991; Dusenbery, 1974). Animals can migrate to one attractive compound, such as Cl-, in the presence of a high uniform level of another attractive compound such as Na+ (Ward, 1973). This result indicates that different attractants have distinct binding sites. The sensory neurons required for many chemosensory responses have been defined by killing identified neurons with a laser microbeam, and testing the operated animals for their behaviors. Killing one pair of amphid sensory neurons, the ASE neurons, results in reduced chemotaxis to the water-soluble attractants Na+, Cl-, cAMP, biotin, lysine, and serotonin (Bargmann and Horvitz, 1991). Simultaneous ablation of all amphid and phasmid neurons except ASE spares chemotaxis, indicating that the role of ASE in water-soluble chemotaxis is unique. A weak residual response to water-soluble attractants after ASE ablation appears to be distributed over numerous classes of neuron including ADF, ASG, ASI, ASK, and ASJ (Bargmann and Horvitz, 1991; Kaufman et al., 2005). Amphid neurons belong to left-right pairs that are symmetrical at a structural level, but gene expression studies revealed a reproducible asymmetry in the expression of receptor guanylate cyclases in the left and right ASE neuron (Yu et al., 1997). In fact, the two ASE neurons are functionally distinct: the ASER (right) neuron preferentially detects chloride and potassium ions, while the ASEL (left) neuron preferentially detects sodium ions (Pierce-Shimomura et al., 2001). The ASE neurons were the first C. elegans neurons to be studied by direct electrophysiological recordings (Goodman et al., 1998). ASE neurons have voltage-regulated potassium currents and voltage-regulated calcium currents, but no voltage-activated sodium channels. Thus C. elegans ASE neurons, like neurons of the larger nematode Ascaris, can have calcium-based signal amplification, but not sodium-based action potentials (Davis and Stretton, 1989; Stretton et al., 1985). ASE has been subjected to a theoretical and experimental evaluation of chemotaxis mechanisms to study the means by which sensory cues are converted into directed movements. These studies revealed that the behavior of C. elegans in a gradient of water-soluble attractants is remarkably similar to the behavior of a bacterium during chemotaxis, a mechanism called “the pirouette model” in C. elegans (Pierce-Shimomura et al., 1999) and “the biased random walk” in bacteria (Berg, 1993; Berg, 1975). 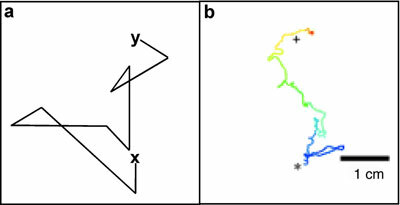 The essence of these models is a temporal strategy in which a short-term memory of attractant concentration is used to decide whether to maintain the current direction of movement or randomly change to a new direction (see Figure 2). Figure 2. The pirouette model for chemotaxis. a. A simulated animal starting at point x with an attractant at point y changes direction once per minute when attractant is constant, twice per minute when attractant is decreasing, and once every two minutes when attractant is increasing. The direction change is always random, but the animal eventually reaches the attractant. The biased random walk was generated using a random number table. b. Representative trace of a wild-type animal during chemotaxis from origin (*) to attractant (+). Color indicates the passage of time during the assay. Note short trajectories away from attractant, and longer trajectories toward attractant. Adapted from Pierce-Shimomura et al. (2005). Direct observation reveals that during chemotaxis, C. elegans responds not to the absolute level of attractant, but to the change in attractant concentration over time (Pierce-Shimomura et al., 1999). When an animal travels up a gradient of attractant, it moves in long forward bouts with rare changes of direction called pirouettes. When an animal travels down a gradient of attractant, it pirouettes frequently. By changing the rate of pirouettes, the animal makes long movements in the right direction, and short movements in the wrong direction. Over time it accumulates at the peak of the gradient. As is true in bacteria, the direction of the turn during chemotaxis is random, indicating that C. elegans does not sense a spatial gradient over its body to decide which way to turn (Pierce-Shimomura et al., 2005). This temporal chemotaxis strategy requires animals to compare current levels of attractant to recent levels. To ask whether C. elegans can perform such a comparison, animals were subjected to rapid uniform changes in their chemical environment. When animals were moved from high to low attractant levels, they responded with a bout of pirouettes; when animals were moved from low to high attractant levels, pirouettes were suppressed (Dusenbery, 1980b; Miller et al., 2005). The rate of pirouettes then returned to baseline through rapid adaptation, updating the short-term memory to match the new attractant conditions. The molecular basis of temporal sensing and rapid adaptation in ASE is unknown. The neurons downstream of ASE in chemotaxis are not well understood. The AIY interneurons are prominent targets of ASE; they suppress pirouettes, but genetic results indicate that they are not required for chemotaxis to ASE-sensed chemicals (Tsalik and Hobert, 2003). ASE has additional targets including AIA and AIB interneurons that may also regulate pirouette frequency. The biased random walk is not the optimal strategy for chemotaxis in a perfect linear gradient, but it is well-suited to following attractants in noisy, turbulent natural conditions. Its strength as a behavioral strategy is that it emphasizes empirical progress - an increase in attractant concentrations. It is remarkable that unicellular bacterial flagellar motors and multicellular C. elegans nervous systems use such a similar strategy for chemotaxis. C. elegans chemotaxes to bacteria, its natural food source, by following both water-soluble and volatile cues (Grewal and Wright, 1992). Many volatile organic compounds are attractive to C. elegans in chemotaxis assays - 50/120 compounds tested in a broad survey were attractive, including alcohols, ketones, aldehydes, esters, amines, sulfhydryls, organic acids, aromatic and heterocyclic compounds (Bargmann et al., 1993). Most of these attractive molecules are natural products of bacterial metabolism. The response to volatile compounds is both diverse and sensitive compared to the response to water-soluble attractants: volatile odors can be detected in the nanomolar range, whereas salts and amino acids are detected in the micro-to millimolar range. Because of this difference in sensitivity, and because the diffusion of small molecules through air is much more rapid than through water, it is likely that volatile odors are used for long-range chemotaxis, and water-soluble attractants for short-range chemotaxis. At least seven classes of volatile odors can be distinguished by C. elegans in experiments in which animals migrate to one odor in the presence of a high uniform level of the second odor (Bargmann et al., 1993). Two pairs of amphid sensory neurons, AWC and AWA, are required for chemotaxis to volatile odors (Bargmann et al., 1993). AWC detects at least five attractive odors (benzaldehyde, butanone, isoamyl alcohol, 2,3-pentanedione, and 2,4,5-trimethylthiazole); AWA detects at least three (diacetyl, pyrazine, and 2,4,5-trimethylthiazole). AWA and AWC neurons have elaborate sensory cilia that are protected within the sheath of the amphid, rather than directly exposed through the amphid socket (Ward et al., 1975; Ware et al., 1975). Odors may reach these cilia by being transported through the sheath to the sensory endings, or by diffusing directly through the cuticle. Like the left and right ASE neurons, the AWCL and AWCR neurons are functionally distinct from each other: one detects butanone, and the other detects 2,3-pentanedione, and both detect benzaldehyde and isoamyl alcohol (Wes and Bargmann, 2001). The distinction between the two AWC neurons is random from animal to animal, but coordinated so that one neuron of each type is generated in each animal (Troemel et al., 1999). AWC asymmetry is required for odor discrimination between the differentially detected odors benzaldehyde and butanone (Wes and Bargmann, 2001). How are odors recognized as attractive or repulsive? A few volatile organic compounds are repulsive to C. elegans at high concentrations. One of these odors, 2-nonanone, is detected in part by the AWB neurons, whose cilia resemble those of AWA and AWC (Troemel et al., 1997). The G protein-coupled receptor for the attractive odor diacetyl, ODR-10, is normally expressed exclusively in AWA neurons. When ODR-10 is misexpressed in AWB neurons, diacetyl becomes repulsive to the animals (Troemel et al., 1997). When ODR-10 is misexpressed in AWC neurons, diacetyl is attractive (Wes and Bargmann, 2001). These results suggest that each sensory neuron is preferentially linked to a particular behavioral response: AWA and AWC to attraction, and AWB to repulsion. Similar results have been obtained in the mammalian sweet and bitter taste systems, suggesting that hard-wired sensory maps define intrinsic chemosensory preferences in many animals (Mueller et al., 2005). When C. elegans encounters chemical repellents, it immediately reverses and turns to change its direction of movement (Culotti and Russell, 1978). These rapid withdrawal responses are obviously different from slow chemotaxis behaviors in gradients. C. elegans is repelled by high osmolarity, heavy metals such as copper, detergents, bitter alkaloids such as quinine, acid pH, and some organic odors (Colbert et al., 1997; Culotti and Russell, 1978; Dusenbery, 1974; Hilliard et al., 2002; Hilliard et al., 2004; Ward, 1973). All of these rapid avoidance responses require the ASH chemosensory neurons (Bargmann et al., 1990; Hilliard et al., 2002; Hilliard et al., 2004; Kaplan and Horvitz, 1993; Sambongi et al., 1999). The ASH neurons are also required for withdrawal from light touch to the tip of the nose (Kaplan and Horvitz, 1993). The ability of ASH to respond to both chemical and mechanical cues defines it as a polymodal nociceptor, analogous to the pain-sensing polymodal nociceptive neurons in vertebrates. ASH responses to chemical and mechanical repellents have been observed in vivo with the genetically-encoded calcium indicator cameleon (Hilliard et al., 2005). High osmolarity, chemical cues, or nose touch induce a sharp increase in ASH calcium. Some of this calcium enters through voltage-activated calcium channels, suggesting that ASH is rapidly and directly depolarized by repellents. In a result consistent with this interpretation, direct depolarization of ASH through heterologous expression of the vertebrate TRPV1/VR1 channel and administration of the TRPV1 agonist capsaicin generates a rapid “artificial” avoidance behavior similar to normal ASH avoidance behavior (Tobin et al., 2002). ASH has synaptic connections with AVA, AVB, and AVD, the forward and backward command interneurons (White et al., 1986). These connections lead to glutamate release and activation of excitatory AMPA and NMDA-type glutamate receptors on the command interneurons (Hart et al., 1995; Lee et al., 1999; Maricq et al., 1995; Mellem et al., 2002). Mechanical stimuli to ASH are less effective than chemical stimuli in activating this network; as a result, mutations in the glutamate receptor glr-1 eliminate ASH mechanical responses while sparing most ASH avoidance responses to chemical stimuli (Hart et al., 1995; Maricq et al., 1995; Mellem et al., 2002). ASH function in SDS avoidance is antagonized by the phasmid neurons in the tail, which share some gene expression patterns with ASH and synapse onto the command interneurons (Hilliard et al., 2002). The antagonism suggests that animals detect repellents with both head and tail neurons, and decide whether to reverse based in part on a comparison between ASH and phasmid neurons. A minor component of repulsion from detergent and heavy metal is provided by additional sensory neurons including ASK and ASE (Hilliard et al., 2002; Sambongi et al., 1999). In addition, the sensory network for organic odor avoidance is altered by starvation, which simultaneously downregulates ASH and recruits ADL and AWB into nociception (Chao et al., 2004; see section 3.1). Many roles of chemosensation in C. elegans are physiological rather than behavioral. The chemosensory neurons express numerous secreted peptides of the TGF beta family, the insulin family and neuropeptide families (Li et al., 1999; Li et al., 2003; Nathoo et al., 2001; Pierce et al., 2001; Ren et al., 1996; Schackwitz et al., 1996). These secreted factors have the potential to act at a distance to affect neuronal and non-neuronal cells throughout the animal. Chemosensation has a major role in control of entry into and exit from the alternative dauer larva stage. At the end of the L1 larval stage, animals exposed to high temperatures, high density, and limiting food modify their development to form long-lived and stress-resistant dauer larvae (Golden and Riddle, 1982; Golden and Riddle, 1984; Golden and Riddle, 1984b; Golden and Riddle, 1984). In the dauer stage, animals assess the same cues to decide whether to recover and resume normal development. Both density and food are sensed by ciliated sensory neurons (Albert et al., 1981). A pheromone constitutively secreted by all animals, called daumone, is used to sense nematode density. An active daumone consisting of a pyranose sugar attached to a fatty acid has been purified and synthesized ((-)-(6R)-(3,5-dihydroxy-6-methyltetrahydropyran-2-yloxy)heptanoic acid; Jeong et al., 2005). The relevant chemical constituents of food that antagonize daumone are unknown. Ablation of the ADF, ASI, and ASG amphid sensory neurons leads to constitutive entry into the dauer stage, regardless of conditions (Bargmann and Horvitz, 1991). Therefore, these neurons are thought to sense the daumone and food cues that regulate dauer formation. This sensory role is best understood in ASI. ASI produces a TGF-beta related peptide, DAF-7, that acts as a neuroendocrine signal to prevent dauer formation and promote normal development (Ren et al., 1996; Schackwitz et al., 1996). Expression of daf-7 reporter genes is reduced by starvation and high density, providing a direct link between sensory inputs and neuroendocrine output. ADF and ASG do not express daf-7, but do express insulin-related ligands for the insulin receptor DAF-2 (Li et al., 2003; Pierce et al., 2001). DAF-2 is the final effector protein that prevents dauer formation in cooperation with the TGF beta pathway, and it is likely that regulation of insulin expression or release has a significant role in dauer formation. ADF also produces serotonin, which has a modest ability to inhibit dauer formation (Sze et al., 2000). Ablation of ASJ amphid neurons leads to permanent arrest in the dauer stage, regardless of conditions (Bargmann and Horvitz, 1991). In addition, ASJ sensory neurons generate a signal that promotes dauer formation in the L1 stage (Schackwitz et al., 1996). This function is constitutively active in daf-11 guanylate cyclase mutants, whose dauer-constitutive phenotype can be rescued by killing ASJ (Schackwitz et al., 1996). ASJ expresses the insulin-related peptide DAF-28, a neuroendocrine regulator of DAF-2 and dauer formation (Li et al., 2003), but the relationships between daf-11, daf-28, and ASJ functions are not entirely understood. The neuroendocrine system that controls dauer formation early in life also functions in mature animals. Intestinal fat storage is regulated by insulin, TGF beta, and serotonin signaling, which derive in part from sensory neuroendocrine pathways (Ashrafi et al., 2003; Ogg et al., 1997; Sze et al., 2000; Thomas et al., 1993). These effects have not been traced to the single-cell level, but are likely to result from the activity of ASI as well as other amphid neurons. Lifespan of C. elegans is controlled by the same insulin signaling pathway that regulates dauer formation, and many sensory neurons have a lifespan-regulatory role (Alcedo and Kenyon, 2004; Apfeld and Kenyon, 1999; Wolkow et al., 2000). Ablation of the ASI or ASG sensory neurons leads to a small, but significant, increase in the adult lifespan of animals that is antagonized by ablation of ASJ (Alcedo and Kenyon, 2004). These cell interactions are reminiscent of the interactions in dauer formation, but the overlap between dauer formation and lifespan is not complete - lifespan is also regulated by AWC, AWA, and ASK neurons, but not by ADF neurons. Another neuroendocrine pathway regulated by sensory neurons controls the body size of adult animals. The sensory neurons required for body size regulation are not defined, but probably include a subset of the amphid chemosensory neurons (Fujiwara et al., 2002; Lanjuin and Sengupta, 2002). Because soil environments have high bacterial metabolic activity, they can have substantial local fluctations in gasses such as oxygen and carbon dioxide (Sylvia et al., 1998). C. elegans has a strong preference for intermediate levels of molecular oxygen, avoiding both low levels of oxygen (<4%) and high levels (>12%) in linear oxygen gradients (Dusenbery, 1980a; Gray et al., 2004). As an aerobic animal, it requires oxygen to live, but may avoid hyperoxia to prevent oxidative damage to DNA and other macromolecules. The most important sensory neurons for normal aerotaxis responses to oxygen are URX, AQR, and PQR (Gray et al., 2004; Cheung et al., 2005; Chang et al., 2006). AQR and PQR have ciliated sensory endings that are exposed to the coelomic body fluid of the animal, while URX sends an unciliated ending to the tip of the nose (Coates and de Bono, 2002). The disposition of AQR and PQR suggests that C. elegans senses internal oxygen in addition to environmental oxygen. These neurons could be analogous to the sensory cells in the mammalian carotid body that detect blood oxygenation. Most biological tissues are oxygen-permeable, and under most conditions C. elegans is probably in equilibrium with oxygen in its environment, as it is in equilibrium with external fluid. However, the dauer stage has an impermeant cuticle and the potential to maintain internal oxygen gradients (Holt and Riddle, 2003). Oxygen regulates C. elegans aggregation into social feeding groups, a behavior that is also called clumping (Gray et al., 2004). The aggregation of social strains is suppressed by shifting animals from air (21%) to the preferred oxygen concentration of 8%. URX, AQR, and PQR are central to social feeding (Coates and de Bono, 2002), and the likely site at which oxygen regulates this behavior. Oxygen is only one of several inputs into social feeding, which is stimulated by the ASH and ADL neurons and antagonized by other amphid neurons, notably ASI (de Bono et al., 2002; Chang et al., 2006). The C. elegans genome encodes over 1000 predicted G protein-coupled receptors (GPCRs), many of which are likely to be chemoreceptors. Most belong to large gene families that are highly divergent between C. elegans and other species (see The putative chemoreceptor families of C. elegans). Of about 100 candidate chemoreceptors whose expression has been analyzed by reporter gene fusions, ~60% are expressed exclusively or predominantly in chemosensory neurons; 20% are expressed in other cell types; and 20% are not detectably expressed (Chen et al., 2005; Colosimo et al., 2004; McCarroll et al., 2005; Troemel et al., 1995; E.R.Troemel, Y. Zhang, L. Tong, unpublished results). If these numbers are representative of all gene families, there should be more than 500 functional chemosensory receptors per animal. The C. elegans candidate chemoreceptors have seven predicted transmembrane domains and are distantly related to the family I (rhodopsin-related) GCPRs. C. elegans also has classical, well-conserved GPCRs that recognize serotonin, acetylcholine, glutamate, and neuropeptides, but these canonical receptors are involved in regular neurotransmission and not preferentially expressed in chemosensory neurons (Bargmann, 1998). Most chemoreceptor genes are strongly expressed in a single left-right pair of chemosensory neurons, although some receptors are expressed in multiple cell types (Chen et al., 2005; Colosimo et al., 2004; McCarroll et al., 2005; Troemel et al., 1995). A single pair of neurons can express many different chemoreceptor genes; for example, at least nine different genes are strongly expressed in ASK neurons. By contrast, mammalian olfactory neurons usually express only one functional odorant receptor gene each (Axel, 2005; Buck and Axel, 1991; Chess et al., 1994). Both the C. elegans olfactory system and the mammalian olfactory system have many receptor genes, and are potentially able to recognize a comparable diversity of odors, but the smaller number of neurons in C. elegans may limit its discriminatory power. Forward genetic screens for olfactory mutants have linked a single receptor gene, ODR-10, to an odor ligand. odr-10 mutants have a 100-fold reduced sensitivity to the volatile attractant diacetyl, but are sensitive to all other odors, including odors with similar chemical structure (Sengupta et al., 1996). odr-10 is expressed in AWA, the diacetyl-sensing neuron, and can confer diacetyl sensitivity on AWB, AWC, or mammalian cells in culture (Sengupta et al., 1996; Troemel et al., 1997; Wes and Bargmann, 2001; Zhang et al., 1997). Three other candidate receptors have been linked to potential biological functions through mutational studies. Inhibition of str-2, which is expressed in AWC, slightly extends the lifespan of C. elegans (Alcedo and Kenyon, 2004). sra-13, which is expressed in AWA, AWC, and non-neuronal cells, affects vulval development and olfactory plasticity by modulating MAPK signaling (Battu et al., 2003). sra-11, which is expressed in interneurons, is required in the AIY interneurons for olfactory imprinting (Remy and Hobert, 2005; section 3.2). In addition to sra-11, many chemoreceptors are expressed in non-neuronal cells or in non-sensory neurons; these proteins might sense internal ligands rather than external odors. Much remains to be discovered about the functions of these large gene families. Chemoreceptor proteins in ciliated sensory neurons are highly localized to the cilia, and excluded from the dendrites and axons (see Figure 3; Dwyer et al., 1998; Troemel et al., 1995). Two genes identified from genetic screens for olfactory mutants, odr-4 and odr-8, are required for the cilia localization of ODR-10 and some other chemoreceptor proteins (Dwyer et al., 1998). In these mutants, ODR-10 is trapped in the cell body. ODR-4 is a transmembrane protein expressed in internal membranes, suggesting that it is involved in receptor folding or transport (Dwyer et al., 1998). Cilia localization of receptors is also disrupted in unc-101 mutants, which lack the Golgi-associated mu1 clathrin adaptor protein (Dwyer et al., 2001; Lee et al., 1994). In unc-101 mutants, chemoreceptor proteins are distributed evenly across the entire plasma membrane, suggesting a loss of sorting specificity. Unlike odr-4 and odr-8, unc-101 affects the sorting of many transmembrane cilia proteins, not just chemoreceptors (Dwyer et al., 2001). Figure 3. The ODR-10 receptor is localized to AWA cilia. A GFP-tagged ODR-10 protein expressed under its own promoter, visualized by confocal microscopy. 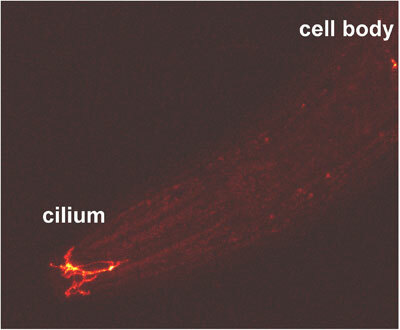 Fluorescence is present in cilia and largely absent from the cell body, axon, and dendrite. Image courtesy of Amanda Kahn-Kirby. Surprisingly, chemosensation, a primitive sense whose rudiments are recognizable in unicellular organisms, uses different families of receptor genes in nematodes, insects, and vertebrates. However, odors of interest are different for different species, and the function of chemoreceptors is not to recognize an abstract chemical space, but to recognize biologically relevant odors. Moreover, most odors are products of other biological entities, and are themselves changing during evolution. Flowering plants, with all of the novel odors of fruits and flowers, evolved only 200 million years ago, long after the common ancestor of nematodes, insects, and vertebrates (~800 million years ago). Like the immune system, the olfactory system tracks a moving world of cues generated by other organisms, and must constantly generate, test, and discard receptor genes over evolutionary time. The C. elegans genome encodes 20 alpha subunits, 2 beta subunits, and 2 gamma subunits for heterotrimeric G proteins (Jansen et al., 1999). In addition to conserved Gs, Gq, Go, and G12-like proteins, the alpha subunits include fourteen nematode-specific Gi-like gpa genes that are expressed in subsets of chemosensory neurons (Jansen et al., 1999). A single sensory neuron can express up to seven of these divergent Gi-like genes. One of the Gi-like genes, odr-3, was identified in genetic screens for olfactory mutants. odr-3 mutants are highly defective in most responses mediated by the AWA, AWC, AWB, and ASH sensory neurons (Roayaie et al., 1998). Thus ODR-3 is a strong candidate for the G protein that acts downstream of many olfactory and nociceptive receptors. Each of the other Gi-like gpa genes has subtle effects on chemosensation (Jansen et al., 1999). A network of positive and negative interactions in AWA and AWC has been studied by generating animals mutant in up to six G proteins (Lans et al., 2004). The weak olfactory responses that persist in an odr-3 mutant are eliminated in odr-3 gpa-3 double mutants, suggesting that gpa-3 has a positive chemosensory function similar to that of odr-3. gpa-5 mutants have no defect on their own, but can suppress the thiazole and diacetyl chemotaxis defects of odr-3 mutants, suggesting that gpa-5 is a negative regulator of chemosensation (Jansen et al., 1999; Lans et al., 2004). gpa-2, gpa-6, and gpa-13 also have negative regulatory roles, and gpa-2 has a positive regulatory role in olfaction (Lans et al., 2004; Roayaie et al., 1998). ODR-3 and GPA-13 proteins are exclusively localized to sensory cilia, but GPA-2, GPA-3, GPA-5 are present in both cilia and axons, and GPA-6 is present only in axons (Lans et al., 2004; Roayaie et al., 1998). The G proteins in axons might respond to internal signals detected by axonal GPCRs. In the ASH nociceptive neurons, odr-3 and gpa-3 have distinct nociceptive functions. Osmotic avoidance and mechanical avoidance in ASH are entirely dependent on odr-3, whereas copper avoidance and quinine avoidance are more dependent on gpa-3 (Hilliard et al., 2004; Lans et al., 2004; Roayaie et al., 1998). The Gi-like protein gpa-11 has a modulatory role in ASH; it allows ASH function to be downregulated by starvation and altered serotonin signaling (Chao et al., 2004; see section 3.1). G proteins play a role in dauer formation, but the complete relevant set has not been defined. Overexpression of gpa-2 or gpa-3 leads to constitutive dauer formation, and loss-of-function mutations in these genes alter sensitivity to the daumone, so these are two likely players in dauer formation (Zwaal et al., 1997). It is increasingly appreciated that heterotrimeric G proteins have functions independent of their traditional signaling roles, and this also applies to sensory G proteins. For example, odr-3(lf) mutants and gpa-3(gf) transgenes disrupt the morphogenesis of certain sensory cilia (Roayaie et al., 1998; Zwaal et al., 1997). A cyclic nucleotide-gated channel encoded by the tax-4 and tax-2 genes is essential for the function of many sensory neurons (Coburn and Bargmann, 1996; Komatsu et al., 1996). This channel is likely to be a sensory transduction channel downstream of G protein signaling. Animals mutant for tax-4 or tax-2 are defective in ASE chemotaxis to water-soluble compounds, AWC chemotaxis to volatile odors, AWB avoidance of volatile repellents, and AFD thermotaxis. They are also weakly dauer-constitutive, especially at high temperatures, and tax-4 mutants are defective in aerotaxis. TAX-2 and TAX-4 are expressed in a subset of sensory neurons (see Table 1) and localized to sensory cilia (Coburn and Bargmann, 1996; Komatsu et al., 1996). Heterologous expression of TAX-4 and TAX-2 generates a channel that is highly sensitive to cGMP and relatively insensitive to cAMP, like the mammalian phototransduction channel (Komatsu et al., 1999). tax-4 encodes an alpha subunit that can form a channel on its own, while tax-2 encodes a beta subunit that enhances tax-4 activity. A plausible pathway for sensory transduction in the TAX-4/TAX-2 neurons is that G protein signaling regulates the function of either a cGMP phosphodiesterase (as occurs in mammalian vision) or a guanylate cyclase, thereby closing or opening the cGMP-gated channel (see Figure 4). Figure 4. Potential signal transduction pathway for odor detection in AWC cilia. Genetic results support the importance of G protein-coupled receptors (GPCRs), Gi-like proteins, receptor guanylate cyclases, and the cGMP-gated channel in AWC. A likely model is that odors are sensed by GPCRs that activate the Gi-like protein ODR-3. ODR-3 regulates either cGMP production by receptor-like guanylate cyclases (ODR-1, DAF-11), or cGMP consumption by phosphodiesterases. cGMP opens the cGMP-gated channels encoded by TAX-2 and TAX-4 to depolarize the cell. In addition to their behavioral defects, tax-2 and tax-4 mutants have defects in activity-dependent gene expression (section 2.6.2) and in sensory axon structure. In tax-2 and tax-4 mutants, the ASE, ASJ, and ASI neurons either form secondary axons or fail to terminate their primary axons at the normal positions in the nerve ring (Coburn and Bargmann, 1996). The excessive sensory axon outgrowth occurs during postembryonic development, while the initial outgrowth of the sensory axons occurs in the embryo (Coburn et al., 1998). Since TAX-2 and TAX-4 are primarily in cilia and not axons, this process is likely to reflect an activity-dependent pathway for maintenance of axon morphology (Coburn et al., 1998). Similar axon termination defects are caused by other manipulations that affect sensory activity, including mutations that disrupt amphid cilia morphogenesis, mutations that block the amphid sensory opening, and transgenic expression of potassium channels that silence sensory activity (Peckol et al., 1999). The C. elegans genome encodes 34 guanulate cyclases that could be sources of cGMP in TAX-4/TAX-2 neurons (Ortiz et al., 2006). 27 of these cyclases are transmembrane proteins, or receptor-like guanylate cyclases (RGCs), and 7 are cytosolic soluble guanylate cyclases (sGCs). In vertebrates, RGCs fall into two class: one class that is coupled to intracellular G protein signaling pathways (e.g., rod and cone GCs, which are downstream of rhodopsin GPCRs in phototransduction), and one class that is directly regulated by extracellular ligands (e.g., ANP receptors). C. elegans olfactory and pheromone-sensing neurons appear to use DAF-11 and ODR-1 as ligand-independent RGCs downstream of G protein signaling. daf-11, which is required to prevent dauer development, is expressed in the ASI and ASJ neurons that regulate dauer formation and recovery. daf-11 is also expressed in AWC, AWB, and ASK neurons, and is required for AWC and AWB olfactory behaviors (Birnby et al., 2000; Vowels and Thomas, 1994). daf-11 has a role in ASE water-soluble chemotaxis, but is apparently not expressed in ASE; its function there may be non-autonomous. daf-11 shares many functions with daf-21, which encodes an Hsp90 chaperone; daf-11 and daf-21 have similar epistasis relationships with other genes in the dauer pathway. Hsp90 can facilitate signal transduction by regulating protein folding, but the nature of the interaction between Hsp90 and DAF-11 is unknown (Birnby et al., 2000; Vowels and Thomas, 1994). odr-1, a second receptor guanylate cyclase, is expressed in the same cells that express daf-11 (L'Etoile and Bargmann, 2000). odr-1 mutants are defective in AWC and AWB olfactory responses, but normal for dauer formation. odr-1 olfactory defects are rescued by mutated ODR-1 proteins lacking an extracellular domain, so the cyclase domains are probably the primary mediators of ODR-1 function in AWC. Mammalian receptor guanylate cyclases are obligate dimers in which the active site is made by combining residues from the two dimer subunits. ODR-1 and DAF-11 each lack key residues required for catalysis, suggesting that they usually function as ODR-1/DAF-11 heterodimers (Morton, 2004). Since daf-11 is required for non-dauer development but odr-1 is not, DAF-11 might dimerize with other guanylate cyclases in ASI or ASJ neurons. ASE chemosensory neurons require TAX-2 and TAX-4 for their function, but might not require G protein signaling. ASE chemosensation is independent of all characterized heterotrimeric G proteins (Jansen et al., 1999), the GPCR-regulatory kinase GRK-2 (Fukuto et al., 2004; see section 2.5.2), and the ODR-4/ODR-8 GPCR trafficking system (Dwyer et al., 1998). Although these are negative results, they open the possibility that an alternative signaling pathway could operate in ASE. An appealing hypothesis is that some receptor-like guanylate cyclases have a taste receptor role in ASE neurons. Three RGC genes, gcy-5, gcy-6, and gcy-7, are expressed only in ASE neurons, and each is expressed exclusively either in ASEL or ASER (Yu et al., 1997). ASEL and ASER detect different tastants, so the GCY expression patterns could be related to the distinct sensory functions of these neurons. However, to date, no sensory defect has been specifically associated with the GCY cyclases in ASE (Ortiz et al., 2006). The seven soluble guanylate cyclases gcy-31 to gcy-37 are expressed mainly in sensory neurons: gcy-31 and gcy-33 are coexpressed in the two BAG neurons in the head, while the remaining five gcy genes are coexpressed in the URX, AQR, and PQR neurons that sense oxygen (Cheung et al., 2004; Gray et al., 2004; Yu et al., 1997). Soluble guanylate cyclases are heme-binding proteins with the potential to interact with gases through the heme iron, and mammalian members of this family are directly activated by the gaseous ligand NO. C. elegans mutants in gcy-35 and gcy-36 are defective in the aerotaxis behaviors mediated by URX, AQR, and PQR neurons (Cheung et al., 2005; Gray et al., 2004). The heme-binding domain of GCY-35 binds directly to molecular oxygen, suggesting that GCY-35 is a primary receptor for oxygen in aerotaxis (Gray et al., 2004). gcy-35 and gcy-36 mutations are also strong suppressors of oxygen-dependent social behavior mediated by URX, AQR, and PQR (Cheung et al., 2004; Gray et al., 2004). Many amphid sensory neurons signal through channels encoded by the osm-9 and ocr-2 genes (Colbert et al., 1997; Tobin et al., 2002). OSM-9 and OCR-2 belong to the TRP (transient receptor potential) channel superfamily, a large group of channels that functions in insect phototransduction, vertebrate pain sensation, and in non-neuronal pressure sensation and osmosensation. There are seven families of TRP channels (Ramsey et al., 2006). The TRPV family includes OSM-9 and OCR-2, the vertebrate nociceptive channel TRPV1 (VR1, the capsaicin receptor) the vertebrate osmosensory channel TRPV4, and the insect auditory (mechanosensory) channels Nanchung and Inactive. In AWA and probably ASH, the OSM-9/OCR-2 channel appears to be the transduction channel downstream of GPCRs and ODR-3 G protein signaling (see Figure 5). osm-9 and ocr-2 mutants are defective in all forms of AWA olfaction and ASH nociception, and probably affect all amphid sensory functions that are spared in tax-4 and tax-2 mutants (Colbert et al., 1997; Tobin et al., 2002). OSM-9 and OCR-2 proteins are localized to the AWA and ASH cilia and are mutually required for each others' cilia localization, suggesting that the two proteins assemble into a single channel complex (Tobin et al., 2002). osm-9 and ocr-2 are also coexpressed in the ADF and ADL amphid neurons, where less is known about their sensory functions. Figure 5. Potential signal transduction pathway for nociception in ASH cilia. Genetic results support the importance of Gi-like proteins, biosynthetic enzymes for polyunsaturated fatty acids (PUFAs), and TRPV channels for all forms of ASH nociception, and G protein-coupled receptors (GPCRs) for some forms of ASH nociception. A likely model is that repellents are detected by GPCRs and possibly by other molecules such as ion channels. GPCRs activate the Gi-like proteins ODR-3 and GPA-3, which regulate the production or consumption of phospholipids containing PUFAs (omega-3 and omega-6 polyunsaturated fatty acids). The GPCR kinase GRK-2 also promotes ASH activation. Lipid mobilization opens the TRPV channels encoded by OSM-9 and OCR-2 to depolarize the cell. TRPV channels may also be directly activated by mechanical, chemical or osmotic stimuli, perhaps with the assistance of accessory subunits such as OSM-10. The link between GPCRs and channel activation in AWA and ASH is likely to involve lipid mobilization. Lipid mobilization through Gq and phospholipase C activates related channels of the TRPC family in Drosophila, but is not required for activation of OSM-9 and OCR-2 (Kahn-Kirby et al., 2004). However, C. elegans mutants defective in the synthesis of long-chain polyunsaturated fatty acids (PUFAs) are defective in chemotaxis to AWA odorants and avoidance of ASH repellents, but proficient in other chemosensory behaviors, suggesting a role in OSM-9/OCR-2 activation (Kahn-Kirby et al., 2004). A combination of dietary supplementation and PUFA biosynthesis mutants suggest that the C20 PUFAs EPA (eicosopentanoic acid) and AA (arachidonic acid) are most effective for OSM-9/OCR-2 activation. The Gq/PLC-independent mechanism by which G protein activation mobilizes endogenous PUFAs in AWA or ASH is unknown. In addition to their direct roles in amphid chemosensation, both osm-9 and ocr-2 regulate expression of chemoreceptor and neurotransmitter genes in sensory neurons (Tobin et al., 2002; Zhang et al., 2004; section 2.6), and osm-9, but not ocr-2, has a role in AWC and ASE sensory adaptation (Colbert et al., 1997; Jansen et al., 2002; section 2.5). osm-9 is expressed in many sensory neurons that do not express ocr-2, including many of the amphid sensory neurons that express tax-4 and tax-2, the mechanosensory OLQ neurons, and some non-neuronal cells (Colbert et al., 1997). In OLQ, osm-9 is co-expressed with the TRPV gene ocr-4. In rectal gland cells, osm-9 is co-expressed with the TRPV gene ocr-3 (Tobin et al., 2002). The functions of TRPV channels in these cells are unknown. ASH nociception is remarkably diverse. It encompasses chemical, osmotic, and mechanical signals; among the repulsive chemicals sensed by ASH are metals, alkaloids, and organic odors. In vivo imaging of ASH sensory activity with the genetically-encoded calcium indicator cameleon suggest that each of these sensory signals directly depolarizes the ASH neuron (Hilliard et al., 2005). All of these signals are transmitted through OSM-9 and OCR-2. Genetic screens for animals mutant in specific ASH functions suggest that different accessory proteins make OSM-9/OCR-2 competent to respond to osmotic, mechanical, or chemical signals. Mutations in the G proteins ODR-3 and GPA-3 diminish ASH signaling, so it is likely that GPCRs mediate some forms of ASH nociception (Hilliard et al., 2004; Roayaie et al., 1998). However, mutations in the G protein-regulatory kinase GRK-2 eliminate chemical signaling in ASH, but not mechanical or osmotic signaling (Fukuto et al., 2004). Since GRK function is probably essential for most GPCR pathways, this result suggests that some kinds of mechanosensory signaling in ASH could be independent of GPCRs. It is possible that the OSM-9/OCR-2 channel has direct mechanosensory or osmosensory roles analogous to the mechanosensory functions of vertebrate and insect TRPV channels. Only the osmosensory function of ASH requires the novel cytoplasmic protein OSM-10, which could be a candidate modality-specific accessory subunit (Hart et al., 1999). ASH-mediated avoidance of the bitter alkaloid quinine requires qui-1, a cytoplasmic protein with multiple WD40 domains (Hilliard et al., 2004). Several WD40 proteins are involved in IFT (section 1.1), so it is possible that QUI-1 has a role in cilia localization of ASH proteins such as GPCRs. Food modulation (see section 3.1) also affects specific ASH behaviors (Chao et al., 2004). Sensory systems continuously adjust their sensitivity and kinetics based on history, and sensory homeostasis and gain control are essential for all chemosensory behaviors. Tracking a gradient of attractant requires a short-term memory to determine whether attractant levels are increasing or decreasing. In the longer term, animals adjust their sensory sensitivity by adaptation to pervasive odors. Many C. elegans modulatory pathways have been identified through chemosensory screens or screens targeted to sensory adaptation. Sensory adaptation and habituation have been examined in the AWC, ASE, and ASH neurons (Colbert and Bargmann, 1995; Hilliard et al., 2005; Jansen et al., 2002; Saeki et al., 2001; Ward, 1973; Matsuki et al., 2006). In general, “adaptation” in C. elegans refers to a diminished chemosensory response after prolonged exposure to the chemical, and not to the short-term changes in sensitivity that might occur while responding to a chemosensory gradient. Prolonged exposure to odors sensed by AWC over minutes or hours leads to diminished chemotaxis responses. These changes are largely odor-specific: adaptation to one AWC odor, such as benzaldehyde, does not affect chemotaxis to butanone, and vice versa (Colbert and Bargmann, 1995). The genes egl-4, sdf-13, and arr-1 affect adaptation to all tested AWC odors (L'Etoile et al., 2002; Miyahara et al., 2004; Palmitessa et al., 2005), whereas osm-9 and the uncloned gene adp-1 each affect adaptation to a subset of AWC odors (Colbert and Bargmann, 1995; Colbert et al., 1997). egl-4 encodes a cGMP-regulated protein kinase that may respond to the cGMP produces during signal transduction (Fujiwara et al., 2002). egl-4 mutants have AWC adaptation defects that can be partly suppressed by mutations that affect a phosphorylation site in tax-2, one subunit of the cGMP-gated channel (L'Etoile et al., 2002). Longer-term AWC adaptation requires EGL-4 translocation to the nucleus, and perhaps new gene expression. The adaptation phenotypes of egl-4 are specific to AWC, but egl-4 also has more widespread neuronal functions (Daniels et al., 2000; Fujiwara et al., 2002; section 2.5.2, 2.6.2, 3.1). sdf-13 encodes a transcription factor of the Tbx2 family that is expressed in AWC and a few other neurons, and essential for adaptation in AWC (Miyahara et al., 2004). SDF-13 is mostly localized to the cytoplasm, suggesting the interesting possibility that nuclear translocation may regulate its activity; perhaps it interacts with EGL-4 to regulate adaptation genes. The ASE neurons have a rapid form of taste adaptation that can be induced within a few minutes of exposure to salts (Jansen et al., 2002; Saeki et al., 2001). Their pattern of cross-adaptation suggests differential adaptation to positive and negative ions. Thus Na+ exposure blocks chemotaxis to Na+ or NH4+, and Cl- exposure blocks chemotaxis to Cl- and acetate. Mutations in osm-9 and adp-1 block ASE adaptation to salts, indicating that ASE and AWC adaptation use common genetic pathways (Jansen et al., 2002). In addition, mutations in a G protein gamma subunit, gpc-1, block salt adaptation (Jansen et al., 2002). gpc-1 reporter genes are expressed in only seven pairs of sensory neurons, not including ASE, so it appears that gpc-1 affects adaptation through nonautonomous signaling between ASE and other sensory neurons (Hukema et al., 2006). The ASH nociceptive neurons show both adaptation to repellents and sensory habituation to repeated brief presentation of repellents (Hilliard et al., 2005). These forms of plasticity develop rapidly (within 1 min for adaptation; within 1-2 trials for habituation) and recover rapidly (within 5 minutes). Copper adaptation does not cross-adapt to osmotic avoidance in behavioral assays. Adaptation can be observed directly by in vivo imaging of ASH calcium responses to repellents. gpc-1 mutants in the G protein gamma subunit are defective in rapid sensory adaptation in ASH, and defective in habituation to repeated ASH stimuli (Hilliard et al., 2005). gpc-1 is expressed in ASH, and its effects in this cell appear to be cell-autonomous. Multiple kinases and phosphatase have roles in chemosensory homeostasis and adaptation. grk-2 encodes the G protein-regulated receptor kinase, a serine-threonine kinase that phosphorylates activated GPCRs; it is required for chemosensation in AWA, AWB, AWC, and ASH (Fukuto et al., 2004). Mammalian GRKs are most strongly implicated in receptor downregulation, but genetic analysis of grk-2 in C. elegans suggests that it acts as a stimulator of GPCR signaling, not just an inhibitor. For example, some grk-2 chemosensory defects are suppressed by overexpressing odr-3, the signaling G protein, or by mutations that enhance G protein signaling. GRKs and arrestins are thought to have similar functions, but C. elegans grk-2 and arr-1 mutants have very different phenotypes (Fukuto et al., 2004; Palmitessa et al., 2005). These results suggest the existence of undiscovered sensory signaling functions involving grk-2. The tax-6 gene encodes the calcium-sensitive serine-threonine phospatase Calcineurin A (Kuhara et al., 2002). tax-6 mutants are defective in thermotaxis and in chemotaxis to attractants sensed by ASE, AWA, and AWC neurons (Kuhara et al., 2002). tax-6 mutants are hyperresponsive to osmotic stimuli that activate ASH, suggesting a role in gain control, the process that matches the magnitude of a behavioral output to the sensory input. Calcium entry through sensory transduction channels or voltage activated calcium channels would be predicted to increase calcineurin activity, and calcium, an indicator of general neuronal activity, is an attractive second messenger to mediate gain control. Calcium is also a second messenger in sensory adaptation (Colbert and Bargmann, 1995), and in AWC, some tax-6 defects are suppressed by adaptation-defective osm-9 mutations. It may be that adaptation and gain control are part of a common calcium-regulated system that sets the sensitivity of sensory neurons. The ttx-4 gene encodes a protein kinase C of the epsilon/eta class (Okochi et al., 2005). This class of serine-threonine kinases is activated by diacylglycerol or pharmacological agents such as PMA. ttx-4 mutants are defective in thermotaxis, chemotaxis to attractants sensed by ASE, AWA and AWC, and avoidance of high osmolarity (ASH). ttx-4 defects in AWA and AWC chemotaxis can be suppressed by activation of another protein kinase, TPA-1, with PMA (Okochi et al., 2005). Chemosensation in AWA and ASH appears to involve lipid mobilization for the activation of OSM-9/OCR-2 TRPV channels, so these lipids may simultaneously regulate TTX-4. The function of lipid-regulated protein kinase C is more surprising in the ASE and AWC neurons, which use cGMP and not lipids as dominant second messengers. One possibility is that TTX-4 interacts with OSM-9 in AWC and ASE adaptation pathways. Strong mutants in the cGMP-regulated kinase egl-4 are partly defective in chemotaxis to many odors sensed by AWC and AWA (Daniels et al., 2000; Fujiwara et al., 2002). egl-4 chemotaxis defects are suppressed by mutations in the SMAD family of transcriptional regulators of the TGF-beta pathway (Daniels et al., 2000). These results suggest that the egl-4 chemotaxis defect results from disruption of a regulatory neuroendocrine network, not from primary sensory defects. The Ras-MAPK pathway is rapidly activated in AWC neurons exposed to odors (Hirotsu et al., 2000). Animals mutant for Ras-MAPK genes have only mild defects in chemosensation, but constitutive activation of Ras signaling leads to strong olfactory defects. Ras/MAPK activation may be a mechanism for downregulating odor sensitivity after intense stimulation. Although Ras/MAPK mutations affect odor adaptation, their effects are due to circuit-level changes in downstream neurons, and not sensory changes (Hirotsu and Iino, 2005). The functions of chemosensory neurons are inextricably linked to their complex patterns of receptor expression, and the analysis of chemoreceptor expression (as defined using transgenic reporter genes) has been a major focus of chemosensory analysis. In addition to the generic cilium regulatory X box transcription factor daf-19 (Swoboda et al., 2000), many chemosensory neurons have one or more specific transcription factors associated with their identity. In most cases, the transcription factors are directly implicated in the expression of the appropriate receptor and signal transduction molecules. As discussed in the Hobert Wormbook chapter (see Specification of the nervous system) and in a recent review (Lanjuin and Sengupta, 2004), mutations in these genes can result in loss of cell identity (che-1, odr-7), transformation into an alternative identity (lim-4, for AWB), or derepression of multiple alternative identities (unc-3) (Chang et al., 2003; Colosimo et al., 2003; Kim et al., 2005; Sagasti et al., 1999; Sengupta et al., 1994; Uchida et al., 2003). Many families of DNA-binding proteins regulate chemosensory identity, including Otx, LIM, and Paired homeodomain proteins, Zn-finger proteins, nuclear hormone receptors, and HLH proteins. Despite the wide variety of transcription factors that act in these pathways, certain motifs repeat themselves in multiple classes of sensory neurons. For example, AWB and ADF are sister neurons derived from a common cell division, as are AWA and ASG. Each of these sister lineages requires a LIM homeodomain gene that is expressed transiently in one sister of the lineage and continuously in the other sister (Sagasti et al., 1999; Sarafi-Reinach et al., 2001; Zheng et al., 2005). Three Otx transcription factors specify thermosensory neuron identity as well as AWB, AWC, and ASE identities (Chang et al., 2003; Koga and Ohshima, 2004; Lanjuin et al., 2003; Satterlee et al., 2001). The ability of the three Otx genes ttx-1, ceh-36, and ceh-37 to specific numerous identities derives partly from differences in their sequences, and partly from the developmental context in which they are expressed (Lanjuin et al., 2003). The left-right asymmetry in gene expression between ASEL and ASER neurons is established by an elaborate developmental cascade of transcriptional regulators that cross-inhibit each others' expression through miRNAs (Chang et al., 2003; Johnston and Hobert, 2003; Johnston et al., 2005; see Specification of the nervous system). Interestingly, the genes for ASE asymmetry do not overlap at all with the genes for AWC left-right asymmetry. A signaling cascade that establishes distinct patterns of gene expression in the left and right AWC neurons requires voltage-activated calcium channels (UNC-2/UNC-36), the calcium-calmodulin dependent protein kinase II (UNC-43), a MAPKKK (NSY-1), a MAPKK (SEK-1), and a Toll-like adaptor protein (TIR-1; Chuang and Bargmann, 2005; Sagasti et al., 2001; Tanaka-Hino et al., 2002; Troemel et al., 1999). AWC appears unique in requiring cell interactions to govern its receptor expression patterns; for the most part, the identities of the chemosensory neurons appear to be established by invariant cell lineages. Genomic studies are increasingly being used to define chemosensory gene expression, a welcome addition to the reporter gene strategies described above. Single-cell PCR and microarray analysis of the AWB chemosensory neurons has been used to find unique genes expressed in this cell type (Colosimo et al., 2004). SAGE analysis has generated an extensive library of ASE-expressed genes (http://tock.bcgsc.ca/cgi-bin/sage140). A bioinformatic analysis has linked an E-box transcriptional motif with the ADL chemosensory neurons, although the transcription factor(s) that specifies ADL identity are unknown (McCarroll et al., 2005). Each chemosensory neuron has a characteristic pattern of gene expression that is established during embryogenesis. These gene expression patterns can be maintained, reset, or updated based on sensory activity and neuroendocrine signaling. The cGMP-gated TAX-4/TAX-2 channel is required to maintain postembryonic expression of the predicted GPCRs str-2 in AWC and srd-1 in ASI, and the OSM-9/OCR-2 TRPV channel is required to maintain expression of the diacetyl receptor odr-10 in AWA (Peckol et al., 2001; Tobin et al., 2002). Non-receptor genes are also subject to activity-dependent regulation. For example, the OSM-9/OCR-2 channel is required to maintain expression of the neurotransmitter biosynthetic enzyme tph-1 in ADF (Zhang et al., 2004). Gain-of-function mutations in the kinase CaMKII (unc-43) suppress the effect of osm-9 and ocr-2 on tph-1 expression, suggesting that calcium entry through TRPV channels can activate CaMKII to send a signal to the nucleus (Zhang et al., 2004). The predicted voltage-activate calcium channel UNC-2 also stimulates tph-1 expression in ADF (Estevez et al., 2004). ASI gene expression is affected by feedback loops between environmental signals, gene expression, and the neuroendocrine regulator DAF-7. The ASI neurons sense crowding and starvation during dauer formation, at least in part by regulation of the cGMP-gated channel TAX-4/TAX-2. A direct sensory input from TAX-4/TAX-2 stimulates expression of the daf-7 gene and the srd-1 chemoreceptor gene in ASI (Coburn et al., 1998; Peckol et al., 2001). Crowding and starvation also inhibit the expression of additional chemoreceptor genes in ASI through an indirect pathway mediated by an autocrine role of DAF-7 (TGFβ) and downstream SMAD transcription factors in ASI (Nolan et al., 2002). 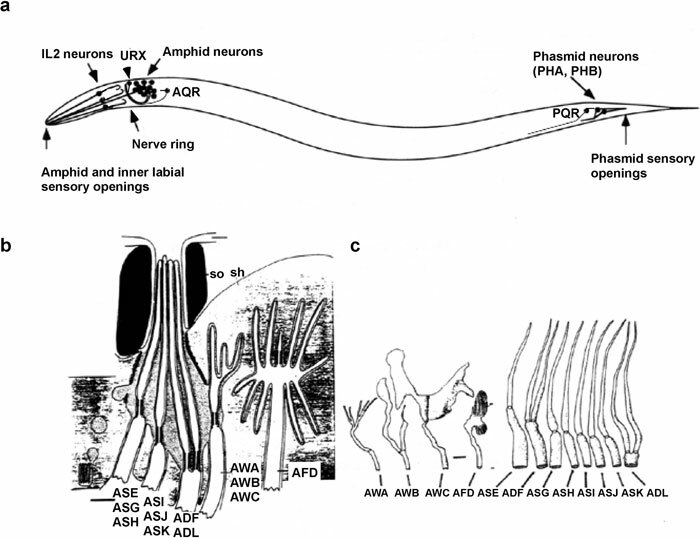 Ultimately, dauer development leads to morphological remodeling of the ASI cilia, further changing the link between ASI and the outside world (Albert and Riddle, 1983). DAF-7 from ASI also has a paracrine function that regulates chemoreceptor gene expression in ASH nociceptive neurons. Postembryonic expression of the chemoreceptor sra-6 in the ASH neurons requires DAF-7 and the downstream SMAD transcription factor DAF-8 (Nolan et al., 2002). Many chemosensory receptor genes have predicted binding sites for SMAD transcription factors such as DAF-8 (McCarroll et al., 2005); it is possible that TGFβ regulation has a widespread role in receptor regulation. An interesting and mysterious regulator of chemoreceptor genes is the AMP/SNF kinase KIN-29 (Lanjuin and Sengupta, 2002). In kin-29 mutants, GPCR expression is altered in multiple cell types: receptor genes are downregulated in AWB and ASH, and upregulated in ASK. The KIN-29 protein translocates to the nucleus upon heat shock, suggesting that it may be a component of a stress-sensing pathway that regulates chemosensation. kin-29 is a component of the sensory neuroendocrine network that regulates body size and dauer formation. kin-29 mutants are small, a phenotype they share with DBL-1 TGF beta pathway mutants. An opposite large body size is caused by egl-4 (cGMP-dependent kinase) mutations (Daniels et al., 2000), which also affect lifespan and dauer formation by regulating TGFβ signaling (Daniels et al., 2000; Hirose et al., 2003; Nagamatsu and Ohshima, 2004). These kinases may couple sensory inputs to a broad variety of behavioral and physiological outputs. Many animals can occupy alternative behavioral states with characteristic features that are stable over time. C. elegans has behavioral states that are evident as long-term locomotor patterns that differ in well-fed, recently fed, or starved animals. When feeding on a bacterial lawn, C. elegans switches between two different behavior patterns (Fujiwara et al., 2002). It spends 80% of its time “dwelling,” feeding on bacteria while moving slowly and staying in a restricted area (see Figure 6). At rare intervals, it switches into an alternative behavioral state called roaming, which involves rapid locomotion across the lawn. The transition between dwelling and roaming appears to involve ciliated chemosensory neurons. Animals with severe defects in the ciliated neurons, such as che-2 mutants, spend almost all of their time dwelling. Conversely, egl-4 mutants roam more frequently than wild-type animals. Cell type-specific rescue experiments indicate that the regulation of roaming and dwelling is distributed among multiple sensory neurons. When removed from the bacterial lawn, C. elegans switches to a behavioral state in which it moves rapidly and reverses frequently. This strategy is called pivoting, area-restricted search, or local search (see Figure 5; Gray et al., 2005; Hills et al., 2004; Wakabayashi et al., 2004), and has the same basic run-and-pirouette components as directed chemotaxis (section 1.2.1). Over the next thirty minutes, reversals are suppressed, shifting the animals to another behavioral state called traveling or dispersal (Gray et al., 2005; Wakabayashi et al., 2004). Pivoting/local search is controlled by many sensory neurons, and the exact set varies depending on the conditions of the assay (Gray et al., 2005; Hills et al., 2004; Wakabayashi et al., 2004). Among those implicated are AWC, ASK, dopaminergic ciliated mechanosensory neurons, AWA, ASE, ASI, and ADL. Some neurons stimulate pivoting and others inhibit it. The transition to traveling/distant search can involve ASI, ASE, ADF, and ASH sensory neurons. Figure 6. 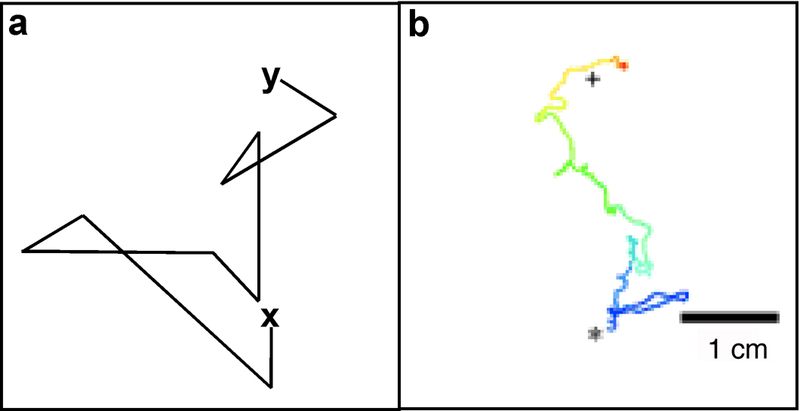 Behavioral states, demonstrated by tracks left by freely-moving animals. a. Dwelling on a bacterial lawn. b. Area-restricted search/local search/pivoting. c. Dispersal/traveling. Adapted from Gray et al. (2005). Pivoting/local search is strongly stimulated by AIB interneurons, which receive input from many sensory neurons, and traveling/distant search is strongly stimulated by AIY interneurons (Gray et al., 2005; Wakabayashi et al., 2004). Many other interneurons have more subtle effects on subfeatures of the behavioral states. The transition between the dwelling state, the pivoting/local search state, and the traveling/distant search state suggests the presence of a food memory that is slowly lost over thirty minutes away from food. The presence of a long-term food memory is also suggested by another locomotor behavior, enhanced slowing on food (Sawin et al., 2000). In enhanced slowing, animals that have been removed from food for thirty minutes show a serotonin-dependent slowing upon the return to food that is not seen in animals just removed from bacteria. The most important source of serotonin for this behavior is the NSM pharyngeal neurons, which may signal the presence of food in the pharynx to the rest of the animal (Ranganathan et al., 2001; Sawin et al., 2000). Serotonin is implicated in the transition between the behavioral states, but its exact function is still under study. Serotonin also has a role in many other responses to feeding and starvation (Horvitz et al., 1982). The repulsive odor 1-octanol is detected exclusively by ASH in well-fed animals, but detected by a combination of ASH, ADL, and AWB neurons in starved animals (Chao et al., 2004). This transition is mediated by serotonin signaling, the G protein gpa-11, and a switch in the sensory properties of ASH. Olfactory discrimination and acuity are enhanced after starvation. After several hours of starvation, olfactory adaptation is enhanced; as a result, odors experienced during starvation become less attractive than novel odors or odors experienced when well-fed (Colbert and Bargmann, 1997). Conversely, olfactory adaptation is completely blocked in the presence of food (Nuttley et al., 2002). Exogenous serotonin prevents these changes, but cannot reverse the changes once they occur. Thus serotonin may be more important in the transition between behavioral states than in the maintenance of specific behavioral states. Associative learning in C. elegans has been suggested since the discovery that animals return to their temperature of cultivation if and only if they had food at that temperature (Hedgecock and Russell, 1975). C. elegans exhibits several forms of learning in which animals alter their response to a specific environmental cue (the conditioned stimulus) based on a strong stimulus that alters the internal state of the animal (the unconditioned stimulus). In some cases, these paradigms meet the strict criteria for associative learning set forth in the psychology literature. More often, C. elegans learning paradigms have a mixed character in which the distinction between associative learning and non-associative sensitization, habituation, and adaptation can be blurry. However, many robust results clearly demonstrate the existence of specific, long-lasting, circuit-level forms of behavioral plasticity in C. elegans. Many learning paradigms are based on pairing chemical cues with food or starvation. Conditioning animals with NaCl in the absence of food leads to a significant reduction in chemotaxis compared to conditioning in the presence of food (Saeki et al., 2001; Wen et al., 1997). Thus even phenomena that superficially resemble sensory adaptation have elements of associative learning. Similar observations have been made in olfactory paradigms (Colbert and Bargmann, 1997; Morrison et al., 1999; Nuttley et al., 2002). hen-1 mutants are defective in NaCl learning; hen-1 encodes a secreted, LDL-related molecule that is released from the AIY interneurons to modulate sensory function. hen-1 mutants also have defects in integrating attractive and repulsive stimuli, and defects in food regulation of thermotaxis (Ishihara et al., 2002). AIY, acting through hen-1, appears to bind multiple food-regulated behaviors in a pathway that is largely parallel to the serotonin pathway that regulates general behavioral states. Learning can be context-dependent. The presence of taste cues or ethanol during olfactory learning leads to memory that is only expressed under the same taste cue or ethanol conditions (Bettinger and McIntire, 2004; Law et al., 2004). Dopamine signaling is required for context-dependent learning in the presence of ethanol (Bettinger and McIntire, 2004). C. elegans can learn to avoid odors associated with infection by pathogenic bacteria, a behavior analogous to mammalian conditioned taste aversion (Zhang et al., 2005). Serotonin production by ADF sensory neurons is required for this form of learning; apparently ADF serotonin has a role in signaling an infected state that is distinct from either the starved or well-fed states of uninfected animals. Pathogenic infection leads to upregulation of serotonin in ADF, revealing an internal molecular correlate of the unconditioned stimulus of infection. Imprinting is a specialized learning process in which early developmental experiences affect the preferences of mature animals. Olfactory imprinting is best known in the salmon, which follows olfactory cues to return to its river of origin for spawning. C. elegans also exhibits a form of olfactory imprinting: exposure of young animals to benzaldehyde or other odors sensed by AWC results in enhanced chemotaxis to the odor in adults (Remy and Hobert, 2005). The “chemoreceptor” gene sra-11 is required for this behavior, but it functions not in AWC but in the AIY interneurons. ttx-3 mutants, which lack AIY function altogether, are also defective in imprinting. Imprinting thus involves a plasticity-related or integrative function of AIY. Mutant screens for animals defective in learning have resulted in the identification of lrn-1 and lrn-2, which affect both taste learning and olfactory learning (Morrison et al., 1999; Wen et al., 1997). Screens based on these complex behaviors should be useful in the identification of many new genes. C. elegans learning should be uniquely tractable to high-resolution molecular and cellular studies in which the mechanisms of behavioral plasticity can be defined in detail. C. elegans evaluates the quality of its environment through a complex and versatile chemosensory system. Peripheral chemosensation is highly divergent between mammals and C. elegans, but regulatory and behavioral mechanisms appear to be more conserved across animals. Among the significant opportunities for future C. elegans chemosensory research are the function, regulation, and evolution of the vast families of chemosensory GPCRs; the discrimination of sensory information by signal transduction networks; the neuronal pathways from chemical input to behavioral output; the integration of cues during behavioral plasticity and learning; and the physiological control of dauer formation, lifespan, and fat accumulation. Berg, H. (1993). Random walks in biology (Princeton, NJ, Princeton University Press). Dusenbery, D.B. (1980a). Appetitive response of the nematode Caenorhabditis elegans to oxygen. J. Comp. Pathol. 136, 333–336. Dusenbery, D.B. (1980b). Responses of the nematode Caenorhabditis elegans to controlled chemical stimulation. J. Comp. Pathol. 136, 327–331. Grewal, P.S., and Wright, D.J. (1992). Migration of Caenorhabditis elegans larvae towards bacteria and the nature of the bacterial stimulus. Fundam. Appl. Nematol. 15, 159–166. Sylvia, D.M., Fuhrmann, J.J., Hartel, P.G., and Zuberer, D.A. (1998). Principles and Applications of Soil Microbiology (Upper Saddle River, New Jersey: Prentice Hall). White, J.G., Southgate, E., Thomson, J.N., and Brenner, S. (1986). The structure of the nervous system of the nematode Caenorhabditis elegans. Philos. Trans. R. Soc. Lond. B Biol. Sci. 314, 1–340. *Edited by Erik Jorgensen. Last revised October 22, 2006. Published October 25, 2006. This chapter should be cited as: Bargmann, C.I. Chemosensation in C. elegans (October 25, 2006), WormBook, ed. The C. elegans Research Community, WormBook, doi/10.1895/wormbook.1.123.1, http://www.wormbook.org. Copyright: © 2006 Cornelia I. Bargmann. This is an open-access article distributed under the terms of the Creative Commons Attribution License, which permits unrestricted use, distribution, and reproduction in any medium, provided the original author and source are credited.